HAMPSHIRE’S Emma Bonney claimed her first women’s snooker title for more than three years with a cue bought on the internet two days previously. Superior matchplay helped the world number three (pictured left with referee Steve Markham) defeat Hong Kong cueist Jaique Ip Wan In 3-1 in the Southern Classic final at Fareham Snooker Club. Bonney, who accounted for two more of the four Hong Kong entries en route to the final, potted a difficult pink down the side cushion to take the first frame. The pair shared the next two. Ip Wan In, needing a clearance in the fourth, sunk a brilliant last red but missed the final brown and Bonney cleared. “I played some really good safety today, which was the telling thing against the Hong Kong girls,” said the 35-year-old from Portsmouth. Bonney admitted she envies the Hong Kong quartet’s professional status. “They’re very dedicated,” she said. “They have a full-time coach and they play full time. Top quality snooker in the semi-finals of the fourth leg of the World Ladies Billiards & Snooker Association (WLBSA) tour saw Bonney edge past two-time IBSF Women’s World Champion Ng On Yee 3-1. Ng controlled the first frame with breaks of 50 and 37. Bonney rallied to draw level with a run of 62 and the six-time world billiards champion ran out a 3-1 winner. Remarkably, Bonney had only five hours practice with her new cue. 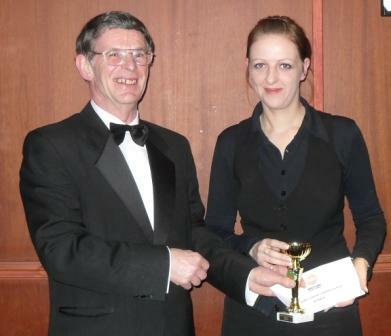 Bonney’s previous WLBSA ranking wins came in the South Coast Classic and British Open in 2008. The youngest player in the draw was the phenomenal Woking schoolgirl Jasmine Bolsover, who celebrated her 12th birthday last month. Bolsover was knocked out in the first round 3-0 by world number 14 Jan Hughes (Cambs) and lost in the Plate 2-1 to former England international Marianne Williams. Ip Wan in produced the shock of the day, knocking out world number one Maria Catalano 3-0 in the last-16. Jenny Poulter (Maidstone, Kent) defeated Gaye Jones (Melksham, Wilts) 2-0 to collect her third Seniors trophy of the season. Suzie Opacic (Chandler’s Ford Snooker Club) prevailed 2-0 against So Man Yan (Hong Kong) to pick up her second Plate trophy since returning to the circuit this season. And Yu Ching Ching (Hong Kong) beat Vicky Carter (Stevenage) 2-0 in the Shield final. Missing her second event of the season was seven-time world champion, and the 2011 Southern Classic winner, Reanne Evans, who is suffering from pleurisy. The draw was carried out by Wayne Griffiths, the son of 1979 world champion Terry Griffiths. Wayne coaches the Hong Kong players. Organisers said a “massive thanks” to Fareham SC’s joint owner Serena Sinanan and her staff. PRELIM: Vicky Carter beat Marianne Williams 3-1, So Man Yan w/o Anna Sanei. LAST-16: Carter beat Natascha Niermann 3-0, Jaique Ip Wan In beat Maria Catalano 3-0, Tina Owen-Sevilton beat Eva Palmius 3-2, Yu Ching Ching beat Suzie Opacic 3-0, Jan Hughes beat Jasmine Bolsover 3-0, Ng On Yee (34) beat Martina Lumsden 3-0, Jenny Poulter (31) beat Gaye Jones 3-1, Emma Bonney beat So 3-1. QUARTER-FINALS: Ip Wan In (56) beat Carter 3-1, Owen-Sevilton beat Yu 3-1, Ng beat Hughes 3-0, Bonney beat Poulter 3-1. SEMI-FINALS (£40): Ip Wan In beat Owen-Sevilton 3-1, Bonney (62) beat Ng (50, 37) 3-1. FINAL (£120/£80): Bonney beat Ip Wan In 3-1. SEMI-FINALS: Jones beat Jan Hughes 1-0, Jenny Poulter beat Martina Lumsden 1-0. FINAL: Poulter beat Jones 2-0. QUARTER-FINALS: Suzie Opacic beat Martina Lumsden 2-1, Marianne Williams beat Jasmine Bolsover 2-1, So Man Yan beat Gaye Jones 2-0, Natascha Niermann beat Eva Palmius 2-0. SEMI-FINALS: Opacic beat Williams 2-0, So (41, 52) beat Niermann (35) 2-0. FINAL (£20/£15): Opacic beat So 2-0. FINAL: Yu Ching Ching beat Vicky Carter 2-0. The next ranking event is the Connie Gough National Championship at Jesters Snooker Hall, Swindon, on Saturday, February 25.